by Dorn C. McGrath, Jr.
Joan Danziger with her beetles. Artists! We have quite a few in Forest Hills. I know five of them personally, and I have seen evidence of several more. It would be fun to get to know all of them, and their work. Several of the artists that I know live along Brandywine Street. Joan Danziger, primarily a sculptor but also a fine painter, has her studio (and her home) atop the hill on Brandywine Street. You’ve read here about her show at the Katzen Gallery at Ward Circle. Be sure to see more of her work on her website, joandanziger.com. Cristy West, who also lives on Brandywine Street, works out of her basement studio and her abstract paintings are often on display in the monthly juried shows at the Art League Gallery in Alexandria, VA. See her work at CristyWest.com. Herb Parsons’ studio is in Silver Spring. Best known for his panoramic and marine landscapes (see HerbertParsons.com), he also finds inspiration in local scenes, such as his charcoal drawing of Great Falls. Herb Parsons and Cristy West live together in Forest Hills. “Great Falls, on the Potomac,” charcoal by Herb Parsons. And then many of you know Dorothy Fall (DorothyFall.com), another painter who lives and has a studio just off Brandywine Street on 31st Street. The book and her art call upon her memories and reactions to the war in Vietnam, and in Cambodia, where she lived in 1962. Dorothy Fall’s current work is a sequel to that period: “Circle Series” and a series called “Afterwards.” She has lived in Forest Hills since December 1963. Dorothy Fall and some of her work. Dorothy Fall invited me and my late wife, Lee McGrath, to dinner one evening a few years ago. Before, during and after dinner, my wife kept admiring the large painting that hung just above the sofa in Dorothy’s living room. It turned out that my late wife BOUGHT that same painting, that night! She thought the painting would look well in our living room, just down the street. 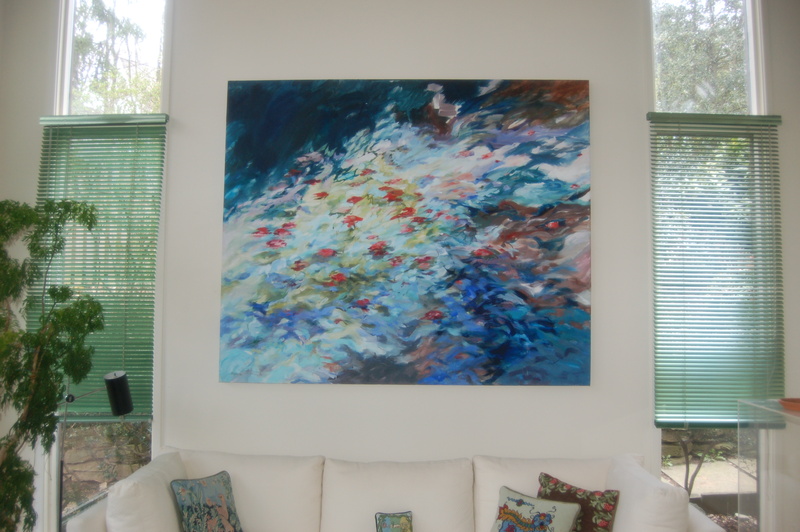 Then came the problem — how to get the six-foot by five-foot painting hung above the right sofa. Far too large for a normal car, van, or taxi, the painting ended up in a truck, which I rented for the trip down the hill. Dorothy herself rode in the back with the painting, holding it vertical, while I carefully drove the painting to my house. Then Dorothy and I hung the painting in the place where it is today — over the sofa! This oil painting was the last work of art she purchased. This untitled painting by Dorothy Fall now hangs in Dorn McGrath’s home. Another well-known multi-media artist lives in Forest Hills! As many of you who have driven Albemarle Street are aware, many of Setsuko Ono’s sculptures are in her front yard, on the uphill side of the block between 29th and 30th Streets, NW. These intriguing figures seem to salute me every morning as I drive by. Setsuko Ono is the artist who has created these sculptures, and many more. Her sculptures are permanently installed in Baltimore, Havana, and Japan. She has recently built a studio and looks forward to painting and sculpting day and night. For more information, you may wish to visit her website, Setsuko-Ono.com. 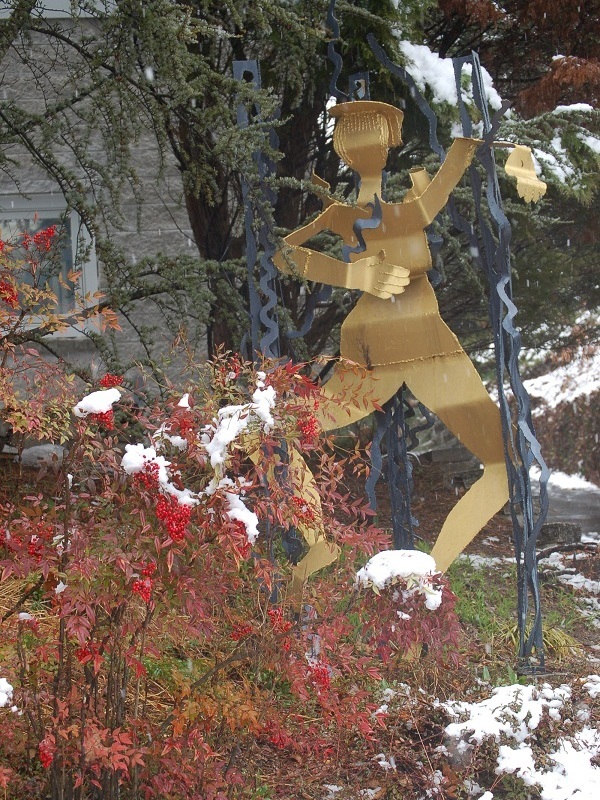 Figure in artist Setsuko Ono’s Forest Hills front yard. Let’s hear from more artists in Forest Hills! What a wonderful article! We are so proud of our Forest Hills artists! Yet another reason to live in this great neighborhood! I am thrilled to be included with Forest Hills artists by this wonderful article about my art career past and current. Many thanks to Marlene Berlin and Dorn McGrath. I didn’t know about most of these artists and its fun to see their works and know they live nearby. Great photos!